Generally, nuts are healthy when you eat them in moderation, according to the Academy of Nutrition and Dietetics. Although honey-roasted nuts contain more sugar than regular nuts, they can still be part of a healthy diet if you limit yourself to eating the recommended amount of 1 to 2 ounces per day. Each ounce of nuts contains between 160 and 200 calories per ounce. Honey-roasted nuts are similar in calories to regular dry-roasted or oil-roasted nuts. For example, honey-roasted almonds have about 166 calories, 5.1 grams of protein, 14 grams of fat and 7.8 grams of carbohydrates, including 3.8 grams of fiber, or 15 percent of the daily value. 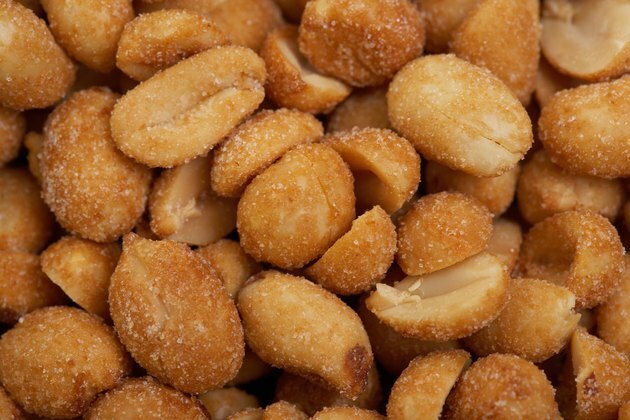 Although nuts are high in fat, the fat in nuts is mainly heart-healthy unsaturated fat. An ounce of honey-roasted almonds has just 1.3 grams of saturated fat. Honey-roasted almonds are a good source of riboflavin, magnesium, phosphorus, copper and manganese. Other nutrients often found in nuts include vitamin E, folate and selenium, with the amount depending on the type of nut. You need the B vitamins riboflavin and folate for turning the food you eat into energy. Vitamin E and selenium are antioxidants that limit damage to your cells from compounds called free radicals. Copper, manganese and phosphorus are important for forming strong bones; magnesium is essential for muscle and nerve function. The heart-healthy monounsaturated fats, fiber, protein and beneficial plant chemicals found in nuts provide a number of health benefits. Eating nuts once per week may lower your risk for obesity by about 3 percent and metabolic syndrome by about 2 percent, according to a study published in "PLOS ONE" in January 2014. Daily consumption of nuts may lower your risk for heart disease by approximately 30 percent, according to an article published in "Current Nutrition Report" in December 2013. The main drawback to consuming honey-roasted nuts instead of eating other types of roasted nuts is the higher sugar content in honey-roasted nuts. With honey-roasted almonds, this increased sugar is about 2 grams per ounce. The American Heart Association recommends that women limit their added sugar consumption to no more than 24 grams per day and men to no more than 36 grams per day.